I’ve never been a frosty polish lover and I’m finicky about reflective polishes (chromes, metallics, mirrors…pick your metaphor). But I’m also weak and easily influenced by trends. So when Essie came out with their recent Mirror Metallics Collection during my strict No-Buy, I had no choice but to scour my stash for a poor man’s dupe. I finally found something that maybe, kinda, sorta fits - China Glaze Devotion. It’s a silvery, almost lavender metallic released as part of the Spring 2009 Romantique Collection. I acquired this polish through a huge China Glaze lot from eBay. That’s the only way it found its way to my stash. And even then, it doesn't have a place on the cool kid racks, but resides in a drawer with the other exiled polishes. Devotion does have one redeeming quality…it’s a great stamping polish. Especially over black. 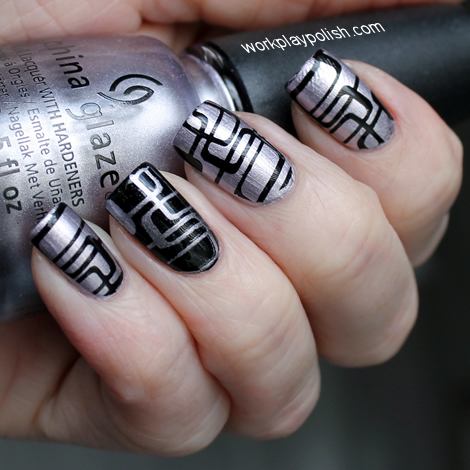 For this mani, I used Essie Licorice on the ring finger and Konad Black to stamp the retro pattern on the other fingers.